We are so excited about this Forest River Folding Camper lineup! See us in Weare and learn more about this Flagstaff Tent 228D model. Expandable and spacious, sturdy and stylish! If you have been looking for a single slide out folding pop-up camper with a king and queen tent end bed then step inside this Forest River Flagstaff MAC Series 228D. The front king and rear queen tent end beds offer comfortable sleeping above ground. Inside you will find a gaucho/bed to the left. On the opposite side along the road side wall there is a single slide out booth dinette. 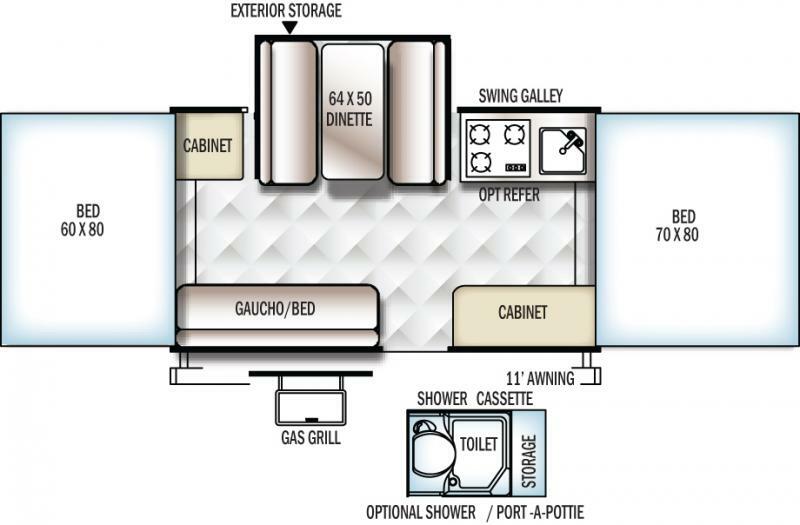 The gaucho and dinette provide extra sleeping space when needed. You will also find a cabinet in the rear road side corner and a swing galley with a three burner stove top, single bowl sink, and an optional refrigerator in the front corner. A second cabinet to the right of entry could be replaced with an optional shower and port-a-pottie with storage for even more of the conveniences of home. Outside, you will find a gas grill, 11' awning, and more!